We specialize in Charlotte tree removal and lot clearing in a manner that’s safe and efficient, with the latest tools and equipment. As a homeowner or business owner, you can be held liable if an unlicensed worker is injured while performing a service on your property. Rest assured that all of our local certified arborists are fully licensed, insured and highly experienced in residential and commercial tree care and tree removal, so you don’t have to worry! We’ll make sure the job gets done right, without any damage to our crew, your home or your property. Dead or dying wood must go before it falls and damages your house or property. A tree or lot of trees blocks the sun daily, causing your lawn to die from a lack of light and an excess of water. A tree is planted too close to your house, driveway or power lines and is creating a safety hazard. You need to create more room on your property for renovations or expansion. That large oak in the backyard has been looming over your master bedroom, and you need to remove it before Charlotte’s next storm season. Or, perhaps, you’re just tired of raking leaves every fall and want your landscape to be more aesthetically pleasing. 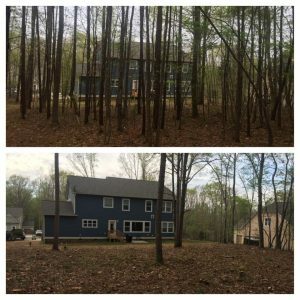 In many cases, flat-out tree removal in Charlotte should be your last resort, as trees can add economic value to your property if they are well-maintained. (This is why we recommend regular tree maintenance services from a local tree care company.) But we can take care of any removals necessary to aid in making your home or place of business safer and more aesthetically pleasing. 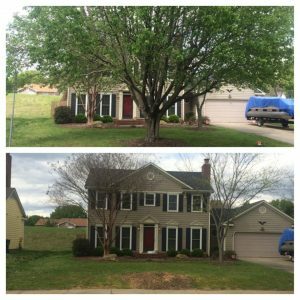 You can stop your search for “landscape design near me“, because whatever your situation, the experts at our Charlotte tree service company can help! Our work is “trés bien”… or so we’ve been told. Why not find out for yourself? We offer FREE, no-obligation estimates by phone, email or on-site. We also recycle the trees we remove into firewood for cold-weather seasons! Trust us when we say that you should leave tree removal and lot clearing up to the experts. Tree care is a tricky business. In order to ensure it’s done safely and correctly, it’s important to hire a team of certified arborists who are experienced in the field. We even have experienced partners across the US. If you are ever in Westlake Ohio, check out our concrete driveway installation experts in Westlake Ohio. They are the best!. We guarantee safety and offer the most affordable prices when it comes to tree removal in Charlotte NC. Wondering how much does tree removal cost? It depends on your situation. However, we are happy to see if we can beat a competitor’s price – just give us a call, and we’ll provide you with a FREE quote! To get your FREE estimate for Charlotte tree removal, you can reach us by phone at 704.207.0842, or fill out the form on this page and one of our local tree service experts will be in touch ASAP!